The cast includes Steven Rimdzius, Brandon Fean, Serena Weil, Kimmie Graham, Wyatt McManus, Lauren Esser, Christina Pullen, Connor McDowell, Spencer Ostrowsky, Sylvia Fisher, Dan Booda, Brynn Jacobs, Evan Kashinsky, Bryce Ritz, Brian Flatley and Victoria Vouk. Teen angst is something I make every effort to avoid, but there is no sign of its drama in this room filled with youngsters making a comedy of the transitional torment. Wendy Force McBride, owner of the Yardley performing workshop and production company Acting Naturally, directs more than a dozen 13- through 15-year-olds as they sing and dance in preparation for 13. They practice a choreographed musical number without fuss. Run lines, answer questions. All with surprising congeniality and calm. Although certainly living lives at least somewhat fraught with fretfulness given their mutual age, these young actors don’t seem to share the teen turmoil of their on-stage characters. 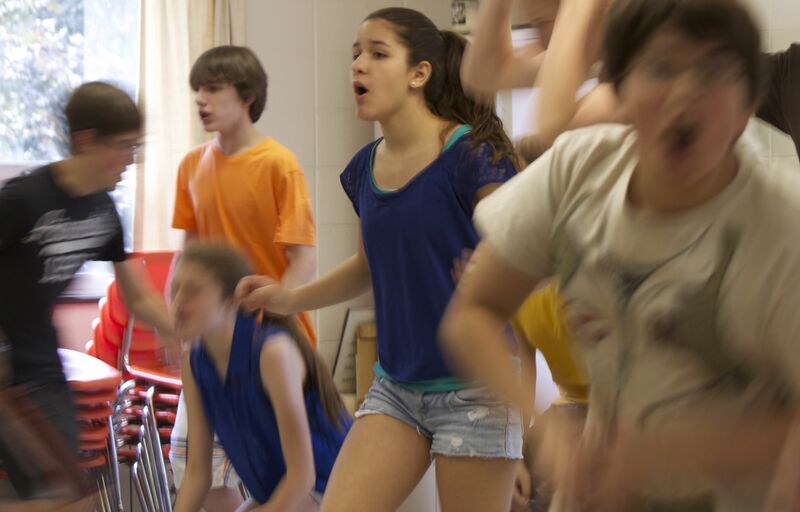 The drama of the teen years is comedy fodder for 13, a musical presented by Acting Naturally July 18 through 21 at Maureen M. Welch Auditorium in Southampton. Langhorne’s Dan Booda, as the musical’s anxiety-ridden Evan Goldman, is complaining that his life just went to hell. Anyone with a teen has heard this song, different lyrics many a time, often accompanied by a rhythmic slamming of doors. But poor Evan has it bad. He’s preparing for his bar mitzvah while navigating his parents’ divorce, which includes a move from Manhattan to Indiana. The skateboarding, gossiping, texting teens in the dance number remind Evan of the importance of this milestone event, “the Jewish Super Bowl.” A girl tells him how excited she is to attend his party, while a boy relays knowledge of invitations printed on money — all raising the bar for a kid with competing distractions. The characters obsess about moustaches, Wonderbras and killing their mother. 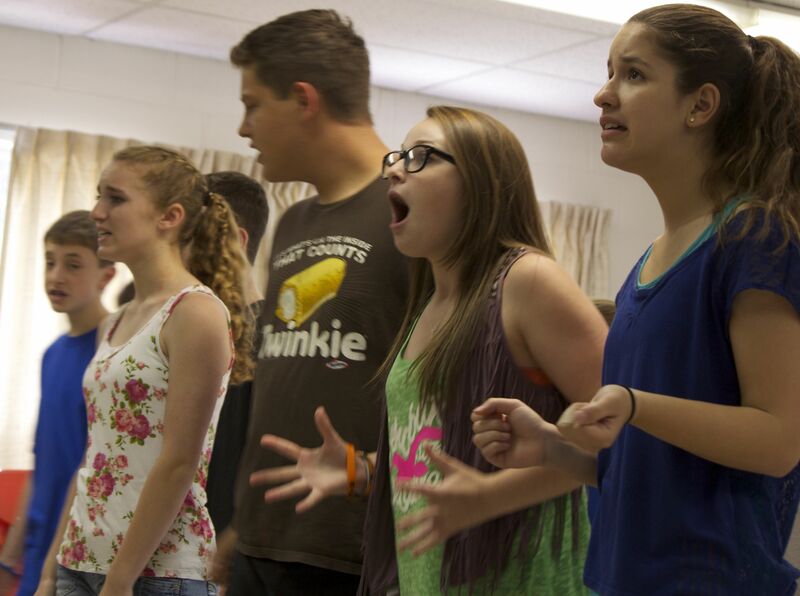 Off the practice stage of this teen rock musical with what McBride refers to as a PG-13 book, Dan and his fellow thespians show little sign of their alter ego’s fixations. 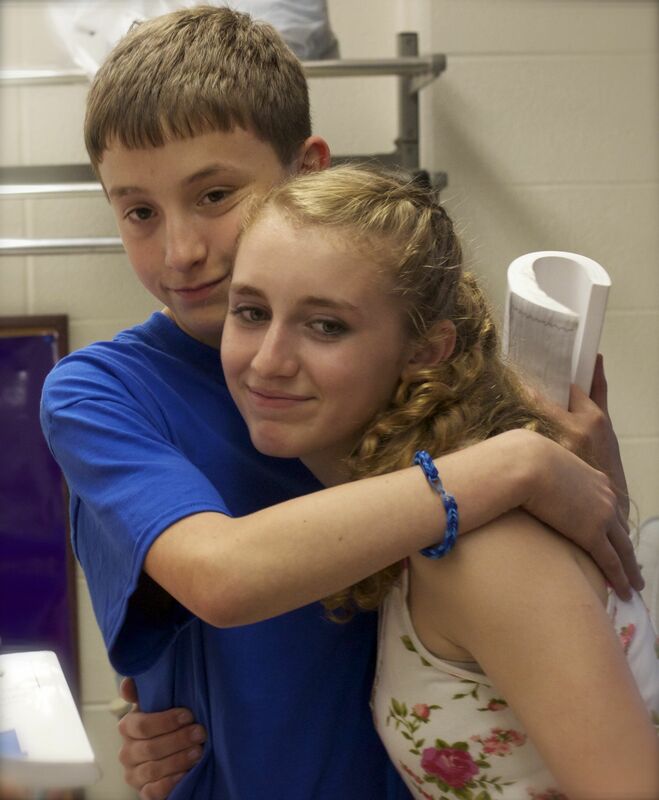 Dan Booda and Lauren Esser portray Evan and Kendra in the coming-of-age musical. Those around him are equally nonchalant, although they have performed with Acting Naturally before. 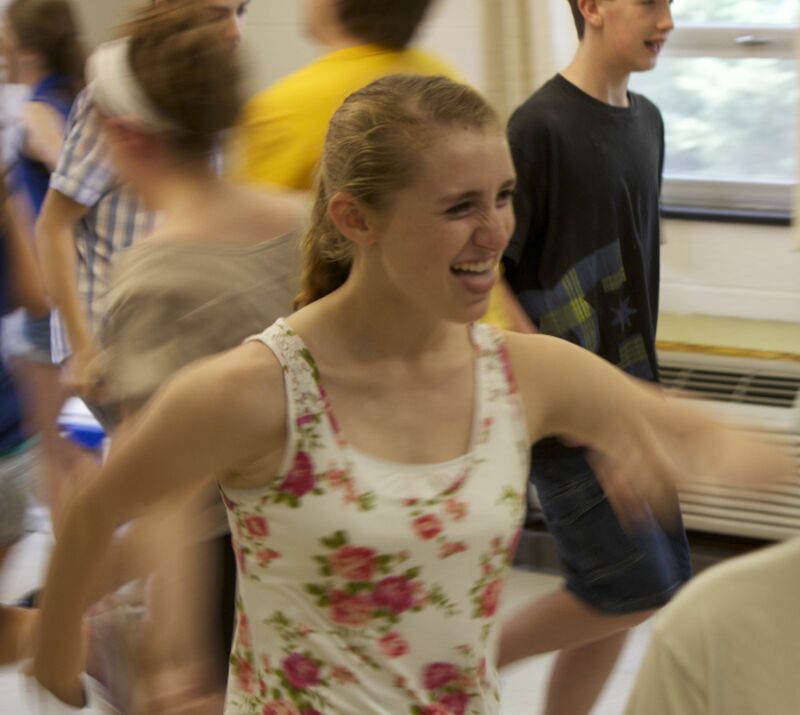 Lauren Esser, a student at Gwynedd Mercy Academy who plays Kendra in 13, has been dancing in shows since she was 3, and acting for several years, as well. Her role is as head cheerleader, vivacious and popular. Playing the decidedly unpopular Archie, Pennwood Middle School student Evan Kashinsky says his parents got him involved in acting, something the Yardley resident has been doing since second grade, mostly with Acting Naturally. Archie walks with crutches, which Evan has never had to do, so he’s struggling to learn to move and even dance with them. Dan shares a hug with Sylvia Fisher, who plays against type as Lucy. I happened to be lucky enough to have heard Sylvia sing outside of Acting Naturally and the burgeoning talent has a gorgeous voice. There will be live music, led by Bob Kashinsky on keyboard. The bass guitar, lead guitar and drummer are high school students. McBride says 13 is high energy, with great music and a lot of dancing. The cast seems to be handling it just fine, surmounting the moves while their characters negotiate life at 13. “The show has such a great message,” Sylvia says. McBride says the young actors are embracing the story, despite its material being “a little racy.” She is long over her concerns at broaching awkward situations with the teens in her cast, calling them professional. “You tell them to learn their lines and they come back with their lines memorized. They have their songs memorized. I’m what Jack Miles would call a pious agnostic. I was raised, and I raised my sons in the Unitarian Universalist tradition. No harm in behaving as though someone were watching even if I’m unsure if someone is. I make an effort to follow the Golden Rule, if for no other reason than to sleep at night. Sleep wasn’t too great this week. Not only did I have an ailing loved one, but so did the person I was trying to interview. I’m always open to more love and compassion in my heart. And music in my ears. Even the most agnostic amongst the pious feels uplifted upon hearing gospel music. It’s in our collective soul, our American DNA. It reminds us of where we’ve been and where we should be. All the more reason we should enjoy Sunday Afternoon Music at the Michener: A Celebration of Gospel Music tomorrow, April 14 from 3 to 4:30 p.m.
Walker (She’s toured with with the greats, including Patty LaBelle, Gladys Knight and Maynard Ferguson, in addition to teaching children about the letters “D”, “B” and “M” on Sesame Street.) will perform with Esther Dinkins and the Back Bench Boys, the male choir from the Second Baptist Church of Doylestown where Dinkins is choir director and Walker is a member. 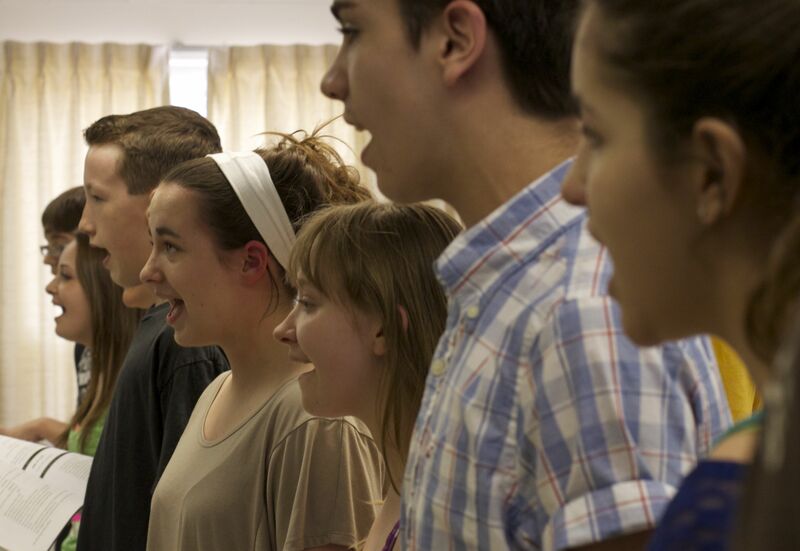 The performance will feature, as Walker says, “good, up-lifting spiritual songs,” full of love and energy. She is on to something. In Robert Gupta’s TED Talk, the LA Philharmonic violinist speaks about his music lesson with Nathaniel Ayers, the talented and tortured Julliard-trained musician, when Gupta discovered how music provided an escape for Ayers from his tormented state. My loved one is home from the hospital, feeling better. That’s why I’m writing this post while listening to Alison Krauss sing “Down to the River to Pray,” which this skeptic will sing with her choir tomorrow morning at services.